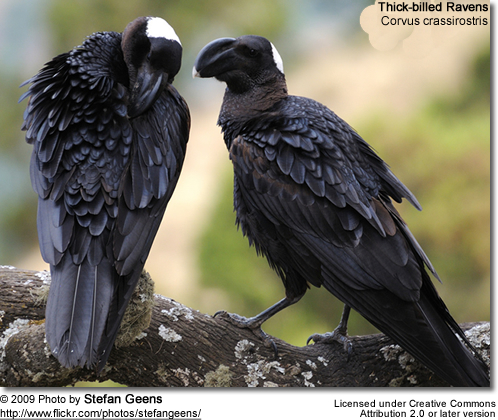 The Thick-billed Raven (Corvus crassirostris) is a very large and distinctive looking African Crow. 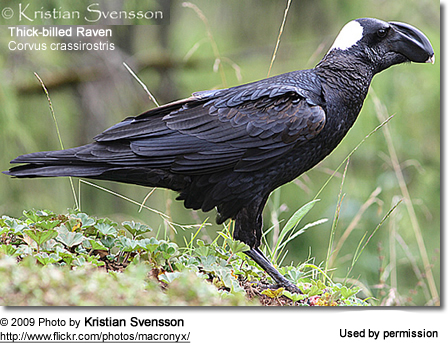 The Thick-billed Ravens and the related Common Ravens have the distinction of being the largest of the Passeriformes (perching birds) - measuring 60 - 64 cm in length and weighing about 1.5 kg. 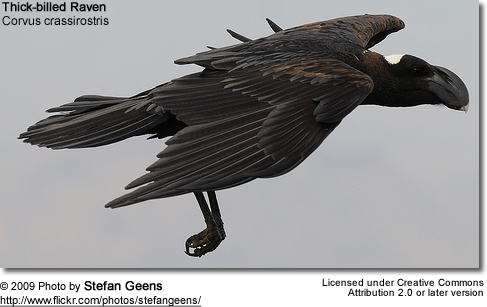 The plumage is mostly glossy black, except for the white patch on the nape and neck, and the dark brownish throat and chest. Its large, deeply curved and white-tipped bill, together with its deep nasal grooves give this raven a very distinctive profile. They occur naturally in the Horn of Africa - in the following countries: Eritrea, Somalia and Ethiopia, inhabiting mountains and high plateau between elevations of 1500 to 3400 meters. 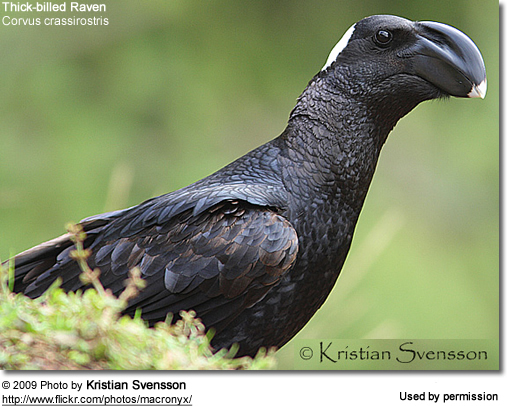 The Thick-billed Raven feeds on just about anything - grubs, beetle larvae from animal dung, carrion (roadkills, etc.) and human food. 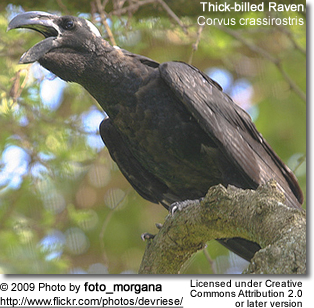 The Thick-billed Ravens generally nest in trees and on cliffs. Their nests are constructed out of sticks. The average clutch consists of three to five eggs. Their calls are described as harsh nasal croaks or low wheezy croaks, or they make "raven-raven" or "dink,dink,dink" sounds.